We are a a two barn, eleven stall facility. Our stalls are 12′ by 12′, airy with rubber mats and all weather, powerful fans. The six run in stables are protected from the sun with shade cloth above and have a sand ‘beach’ turnout attached. The horses love to play, roll and enjoy the outside environment. All horses are given daily turnout in the pasture or sessions on our hot walker and some owners choose both. 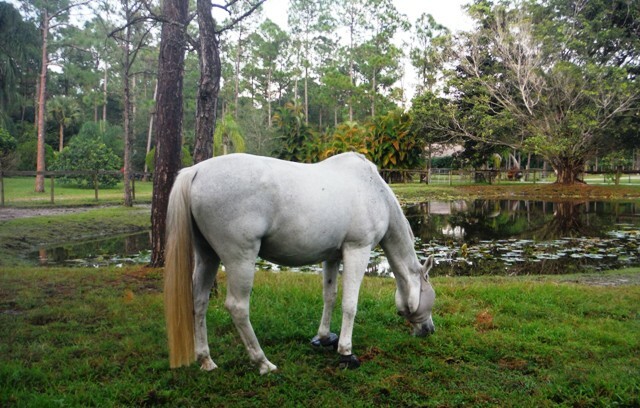 We often golf cart the horses down the lovely sand roads and canals, a huge plus for living in Jupiter Farms. All horses love the golf cart, it has become part of our conditioning program. Turnout is safe, wooden fenced with a lovely pond in the middle for the horses to drink and play. 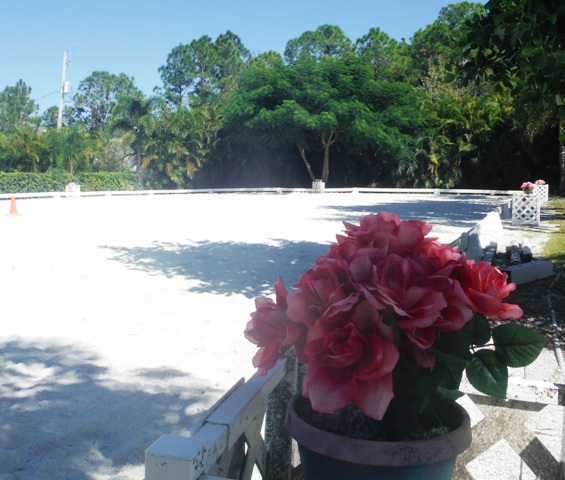 Our dressage arena is surrounded by Palm trees providing shade and a relaxed atmosphere. The arena is olympic sized and decorated with flowers. The arena is well built with amazing drainage and unlike our neighbours, we are able to ride year round!